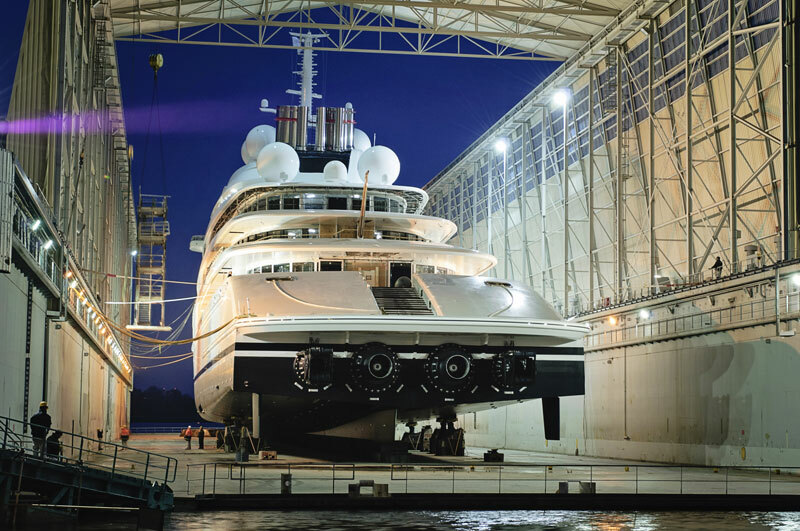 For the past few days, the Internet has been abuzz in anticipation of the re-emergence of Project Azzam at Lürssen. It finally happened today. Considering Project Azzam’s 590’6” (180-meter) LOA and towering height—her navigation mast rose far above the floating dock’s roof—it’s no wonder people are talking about her. If you’ll pardon the pun, she eclipses the world’s largest yacht, Eclipse, by about 57 feet. And, people have been talking about Project Azzam ever since the megayacht was first seen publicly in May 2012. That’s when she floated out of her first build shed and into a second one, minus her bow section. The reason: Project Azzam’s initial build shed was 558 feet (170 meters) long, limiting the amount of work that Lürssen could do there. Confidentiality agreements limit the amount of information that can be released. Her LOA was approved for public consumption, as was the fact that Nauta Yachts was chosen by the owner, in a contest, to style her profile. Note that she has six decks and mostly covered spaces. That seems to mean that Project Azzam will not really be used for sun-worshipping. 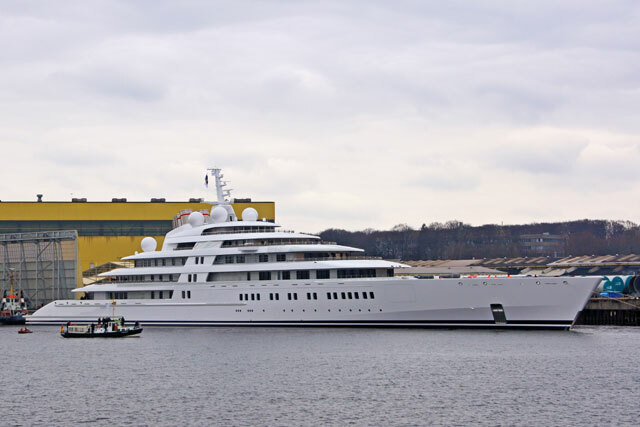 Of course, it’s all still speculation, as “Azzam” may not even be the true name of this mammoth megayacht. Not until the nameboard is seen and/or the name changes on official documents will we know for sure, because a lot of people are being paid to keep their mouths shut—and they’re doing a good job. 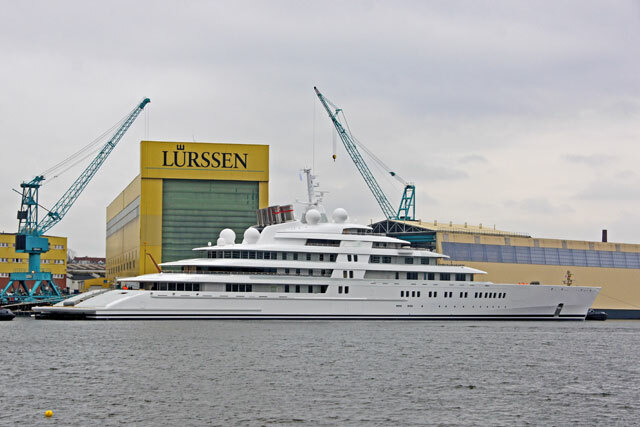 UPDATE: Lürssen released some details for the first time. It confirms the name and LOA, adding that the beam is 68’4” (20.8 meters). The draft is unexpectedly shallow for such a massive megayacht, just 14’1” (4.3 meters). Our guess on the propulsion package was wrong: Lürssen says two gas turbines will indeed be aboard, along with two traditional diesel engines, totaling an astounding 94,000 hp. This will allow Azzam’s speed to exceed 30 knots. The owner selected Mubarak Saad al Ahbabi to oversee Azzam, from initial concept to completion. (Coincidental or not, the director of the department of the president’s affairs for the United Arab Emirates has the same name.) The directive was, obviously, a large megayacht, one with an enduring design to avoid looking dated, yet also reflecting originality and contemporary touches. The owner further wished to cruise at high speeds in warm, shallow waters. Lürssen’s in-house team has provided naval architecture and engineering, complementing Nauta Yachts’ styling. Inside, Christophe Leoni, a French designer, is creating a decor in keeping with what Lürssen terms a “turn-of-the-century Empire style.” The Empire style dates back to the early 1800s, with somewhat rococo elements (think Napoleon’s Versailles). Imagine the effect of this in the 95-foot-long (29-meter-long) saloon, which has a decided lack of pillars. Perhaps most impressive of all, Azzam’s delivery is set for later this year, making her build time just three years. Yes, Ben, good point; though we are still amazed at a yacht of this LOA having that type of setup! It’s one thing to know it’s possible, but it’s quite another to see it.